This impressive palm-like succulent plant had been in our garden for about 5 years now. Among all its common names, we love ‘Ponytail’ best as it fits it beautifully, with its medium-green leaves ‘tied together’ and cascading down giving an appearance of a pony tail! I’m glad that we’ve transplanted it in a shallow container. That way, it’ll stay small and elegant to suit our small-sized garden. A very hardy, fuss-free and easy-to-grow plant that’s great for beginners! 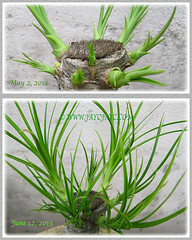 Botanical name: Nolina recurvata (basionym: Beaucarnea recurvata, syn. : B. tuberculata). Common name: Ponytail, Ponytail Palm, Elephant’s Foot, Elephant Foot Tree, Bottle Palm, Beaucarnea. Family name: Agavaceae (also placed in Asparagaceae, Liliaceae, Dracaenaceae, Nolinaceae, Ruscaceae). Origin: Native to the states of Tamaulipas, Veracruz and San Luis Potosi in southeastern Mexico. Plant type: A succulent and palm-like evergreen tree. Features: Nolina recurvata is an impressive species of the genus, Nolina. A very slow growing plant that practically thrives on neglect. 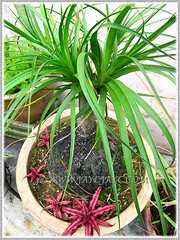 Bottle Palm can reach 9 m in height and its swollen base about 3.7 m wide, though generally grows between 1.8-2.4 m tall. It displays such grace like a beautiful ballet dancer, with its arching upwards, then drooping downwards curving leaves at the top of its trunk that tapered upwards from its very noticeable swollen base. Looking similarly like a palm but is not one. An evergreen succulent tree with simple, light green coloured and leathery leaves that are strap-shaped and tapering at the ends and spirally arranged. Ponytails are dioecious, with male and female reproductive organs on separate plants. Flowers are produced on large and aged plants, with showy upright panicles of creamy white flowers. These will be followed by spectacular erect panicles of pinkish, 3-winged seeds on mature female plants. 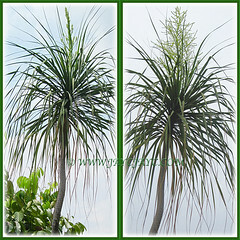 Culture (Care): Nolina recurvata or Ponytail Palm grows easily with least maintenance. Moisture: Minimum water requirement as very drought tolerant. Allow soil to dry between waterings. Soil: Grow in sandy-loam and well-drained soils. Nevertheless, it’s adaptable to any free-draining garden soils. Do not overwater to prevent root rot. Others: If its foliage doesn’t look good or healthy for whatever reason, it can be cut back right down to about 20-30 cm above the caudex and new fresh growth of plantlets will emerge. These can be used to propagate new plants. 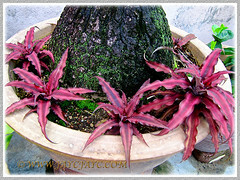 Or just allow the plantlets to mature to create a beautiful multi-trunk Elephant Foot Tree. Feed once monthly with a balanced foliage fertiliser for healthy growth. Flower production will only occur on large and aged plants. It is free of serious pests and diseases. For subtropical and temperate regions: Hardiness: USDA Zone 9-12. It is frost hardy and tolerates drought well. Mature plants can tolerate temperatures to -7.8°C and will probably flower after 10 years of age in spring to fall. Water sparingly in winter. 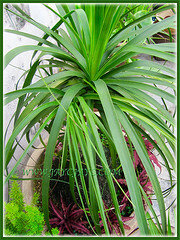 Nolina recurvata can be planted in a brightly lit, frost-free greenhouse or conservatory. Usage: Nolina/Beaucarnea recurvata, with an erect, arching and architectural form, will be an impressive ornamental accent or specimen in any garden, providing a tropical scenario with its palm-like stature. Great to add to your rock garden or landscape for a dramatic and spectacular effect with its distinctive ponytail-like foliage and enlarged caudex. Ideal to be grown in large decorative pots or shallow containers, located outdoors near patios and decks or used as a decorative houseplant indoors. 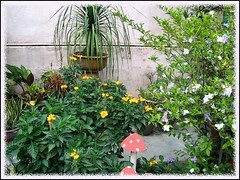 Plant it to attract dragonflies and butterflies, if you’re a nature lover. 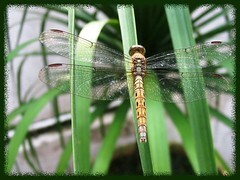 We were delighted that it attracted a visiting dragonfly, a female Orthetrum testaceum! I have a pair of these plants and was eager to know the correct name. I am thankful. However, I would also like to know what the bottle-like portion of the plants is – modification of the stem? And how to propagate it ? Great to know that you’ve nailed your plants ID, yashwant singh! 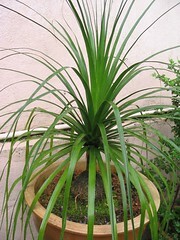 According to About.com-Houseplants, Ponytail Palm does sometimes produces offsets at the base and these can be potted up individually as new plants. However, I’ve yet to see such offsets on our 11-year old potted plant. In the past, I have cut into the top of the bulbous base with a clean knife and a new ponytail has erupted from that incision. Did not, however, try to remove the growth and pot it out. If I ever get an extra plant, I’m willing to give it a try though. Thanks for the information supplied by this site. Love it! You’re most welcome, Sandra. Thanks for sharing your experience with this beauty.